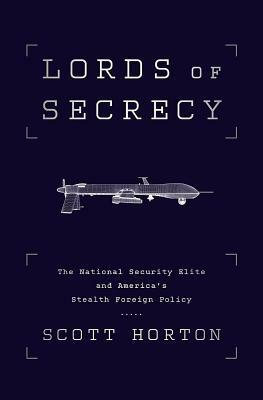 LORDS OF SECRECY: THE NATIONAL SECURITY ELITE AND AMERICA’S STEALTH WARFARE by Scott Horton. New York: Nation Books. 2015. 272pp. Cloth $26.99. ISBN: 978-1-56858-745. Paper $15.99. ISBN: 9781568585178. E-book $15.99. ISBN: 978-1-56858-488-1. 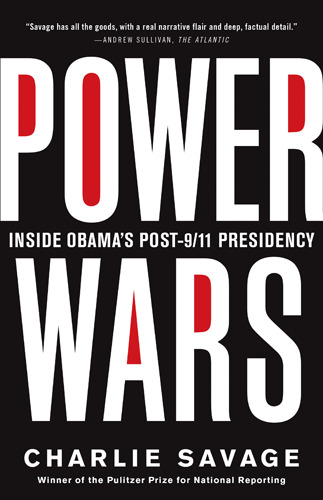 POWER WARS: INSIDE OBAMA’S POST-9/11 PRESIDENCY by Charlie Savage. New York: Little, Brown and Co. 2015. 784pp. Cloth $30.00. ISBN: 978-0-316-28657-2. E-book $15.99. ISBN: 9780316286682. Reviewed by Daniel N. Hoffman, Professor Emeritus of Political Science, Johnson C. Smith University. Email: guayiya@bellsouth.net. Two important books provide different perspectives on the workings and the impact of the national security state. Scott Horton is a human rights lawyer and Harper’s Magazine contributing editor. LORDS OF SECRECY begins with his extended reflections on democratic theory and the implications of bureaucratic secrecy for the health of a democratic system. Horton then describes the rise of the current national security state and its current practices of drone warfare, war on whistleblowers, and unilateral executive war-making in Libya and Syria, assessing each in the context of his democratic concerns. He concludes with an overview of specific areas where secrecy can and cannot be justified, and proposes a list of needed reforms to the current system. Horton’s lords of secrecy are those occupying key positions in the several agencies with national security responsibilities. They use their control of classified information not just to protect the nation but to enhance their own power, vis a vis each other as well as Congress and the public. “Secrecy is highly corrosive to any democracy…. [D]ecisions … are removed from the democratic process and transferred to the apex of the secrecy system, where only the lords of secrecy can influence them” (p. 17). The traditional checking powers of Congress and public opinion are severely eroded. While other factors have contributed to this erosion, secrecy is perhaps the most powerful. As the size of the national security apparatus has grown over the years, the zeal and capacity of Congress to oversee and manage it has shrunk. In response to public protests against the Vietnam War, elites moved toward a volunteer army, heavy reliance on defense contractors, and lower casualty military technologies (such as drones), all combining to dampen public vigilance about the costs of war-making. Horton traces our vision of democracy back to ancient Athens, where direct engagement of citizens with affairs of state was a core concept. Despite the vast differences between the two polities, we still use remarkably similar rhetoric of freedom and democracy in justifying our war-making. Yet, for Athenians, “direct democratic participation in questions surrounding war and peace was the very essence” of democracy (p. 31). That included essential questions of strategy, such as choosing military leaders and honoring or punishing them. Athenians benefited from their conception of active, knowledge-based democracy, for which Horton credits Protagoras. Enlightenment thought and the [*7] new American state embraced analogous ideas of knowledge-based democracy. Though secrecy was sometimes needed in diplomatic and military affairs, the Founders recognized that voters must have access to sufficient information on major issues, including questions of war and peace. Modern thinkers like Dewey, von Hayek, Popper and Habermas elaborated new defenses of knowledge-based democracy. Yet recent American leaders “have mobilized the language of fear historically used by authoritarian states to foreclose questioning. And in their obsession with secrecy and surveillance technologies they implicitly present democracy as something weak….” (p. 33). “[U]nbridled secrecy is a dagger pointed at the heart of democracies, threatening to invalidate their claim to be democracies in the first place” (p. 50). Horton moves from normative political theory to the empirical studies of Weber, Simmel, Shils, Moynihan and Rourke. As he summarizes their findings, bureaucrats love secrets and are always tempted to conceal anything that might embarrass them or reduce their political influence. They will say that an enemy could use the information to harm the country, but more often than not the real concern is for the bureaucrat personally or the agency. Secrecy produces a government that is more poorly informed and more corrupt. Horton illustrates with four examples of sustained wrongdoing involving CIA officers and contractors. The available safeguards include self-restraint, enforced by Inspectors General (Horton does not focus on the presidential role), congressional oversight, the courts, and investigative journalism. Shils and Rourke, writing in the 1950s, were relatively optimistic about the robustness of these. Moynihan’s 1997 Commission Report took a far dimmer view: “The national security state developed a vast secrecy system which basically hid from us our own mistakes” (p. 77). The Commission proposed sweeping reforms, and presidents adopted several; yet the annual volume of classification continued to accelerate, from 6 million documents in 1996 to 15.6 million in 2003. Remarking on the complete lack of accountability for decisions leading to and during the second Iraq War, Horton traces the technological and institutional innovations since World War II that produced this situation. The 1947 National Security Act formalized a new culture of secrecy born at Los Alamos, created the CIA, and authorized it to engage in covert actions, subject to presidential authorization and congressional oversight. The Act specified that secrecy classifications could not be invoked against such oversight, but “the bureaucrats had different ideas” (p. 100). With the Vietnam War, it became clear that Congress was no match for the lords of secrecy, with their vast budgets and staffs. The war was launched and escalated with a minimum of democratic deliberation. Its failure led to several reforms, including the War Powers Resolution, but the bureaucrats developed effective countermeasures. “Two hundred years of American military and civic tradition went out the window” (p. 108). Drone warfare is a further extension, beyond the volunteer army and employment of contractors, of the drive to depoliticize war-making. “The armed drone has one attribute … that endears it to the national security elites: it is a consummately secret weapon” (p. 110). The rules for targeting and the number of casualties—especially civilian casualties—are closely held. Yet the only topic capturing public attention has been the four occasions when US citizens were targeted, even though the Due Process clause protects “persons,” not “citizens”. The circumstances were leaked, but the [*8] but the Office of Legal Counsel (OLC) opinion outlining the legal justification was withheld, until a court ordered its partial disclosure. Horton also notes that the drone program is run by the CIA and not the Pentagon, which arguably violates the National Security Act. He calls for broader debate about the costs and procedures of drone warfare. Horton next examines the impact of recent large-scale leaks and official responses. Edward Snowden’s disclosures, for example, “contained frank appraisals and explanations of NSA programs that often directly contradicted what NSA leaders had given to the public and to Congress, and that congressional leaders had then parroted” (p. 130). Congressional oversight was not fulfilling the hopes of those who founded the national security state, and the checking role of the media was utterly dependent on leakers. Yet the protections available to whistleblowers are sorely inadequate. Internal complaints are commonly futile, and disclosure to the media and the public are generally not protected. Instead, recent administrations have made unprecedented use of the Espionage Act against leakers. The pattern reflects the power of the lords of secrecy: decisions to prosecute are political, and the powerful routinely break the law with no consequences whatsoever. The Obama administration’s oversight of national security elites is weak. “The core change that helps explain the sudden proliferation of whistleblower prosecutions is an internal restructuring of the Justice Department [under] the 2005 Patriot Act reauthorization” (p.248). Whereas the previous system included some political accountability, under the new system, decisions to prosecute are “effectively taken by lawyers who understand their role fundamentally as serving the intelligence community” (p. 149). They ignore the fact that leaks can stimulate valuable debates and policy changes. Prosecutions, Horton argues, should be reserved for the most exceptional circumstances. Curiously, he does not entertain the proposition that First Amendment protection for leakers is an indispensable feature of our democratic system. It is true that the courts have not embraced this idea, but that perhaps reflects what Horton terms “the supine attitude adopted by most of the federal judiciary toward assertions of secrecy” (p. 132). Horton uses our military actions in Libya and Syria to further illustrate the declining roles of Congress and the public in war-making decisions. Due to the Constitution’s vagueness, Horton argues, the war-powers question is fundamentally political, dependent on situations and personalities; yet the long-term trend seems clear. Initially reluctant, the Obama administration abruptly launched a program of mostly covert support for Libyan rebels. At first Congress played no role, but as the mission shifted from humanitarian protection to regime change, the House passed a Resolution demanding explanation as to why its authorization had not been sought. The administration replied that, with no troops on the ground, its actions did not constitute “hostilities” under the War Powers Resolution. Leaders of both parties deemed this ridiculous, but no formal action followed. In contrast, the British and French parliaments both voted to authorize their countries’ allied operations. US involvement in Syria followed a broadly similar pattern. Reports of sarin gas attacks by the Assad regime led to consideration of massive allied bombing attacks. The British parliament voted no; the scheduled French vote was abandoned after Russian mediation resolved the sarin issue. In this case Obama surprised Congress by asking them to vote, but the Russian move made that unnecessary. Congress again behaved as if avoiding responsibility was preferable to asserting its powers. There is “an emerging bipartisan consensus in Washington that values robust [*9] presidential war-making powers and gives short shrift to the power of Congress to limit or control their exercise” (pp. 170-171). The lords of secrecy emerge as the winners, as “the space for democratic discussion … contracts or is entirely eliminated” (p. 172). Horton’s conclusion points to the sheer magnitude of over-classification. “[M]andatory classification review conducted in 2010 established that 92 percent of reviewed documents did not need to be classified” (p. 233, n.7). Horton judges that secrecy is usually warranted regarding advanced weapons systems, critical signals intelligence and cryptography, and identity of covert operatives, though even here there must be room for exceptions. On the other hand, he argues persuasively that concealing legal rules and official legal opinions is never legitimate, nor is retroactive classification of published documents. The Office of Legal Counsel (OLC) torture and drone strike memos exemplify the former practice; the latter has befallen over 25,000 documents, many of 1940s and 1950s vintage, formerly public but now withdrawn. Horton judges that the current classification guidelines are sufficiently clear and express valid principles, yet he finds several shortcomings. First, they fail to specify that the disclosure of even validly classified information may sometimes be warranted by an overriding national interest. Second, the lords of secrecys’ insistence on increasingly strict gag rules for subordinate public officials hobbles the press and “points to a systematic refusal to come clean about harmful falsehoods and deceptions in the past” (p. 191). The National Intelligence Director’s new rule applies the gag even to unclassified information! Third and most important, the official classification guidelines “are not now and have never been fairly observed or enforced…. Routinely classifying almost everything is the `safe’ alternative for government servants ….” (p. 193). Horton might have added that for decades, new presidents have quickly modified their predecessor’s Executive Order on classification, producing dramatic zig-zags in the announced preference for secrecy or publicity; yet the underlying rise of the lords of secrecy has continued unrestrained. The same fate would likely befall a legislated classification system. Horton endorses a six-point reform proposal from the Brennan Center for Justice, designed to reduce over-classification by making officials’ conduct more transparent and accountable within their own agencies. He does not specify whether this should be embodied in legislation or executive order. He also admonishes Congress and the press to try harder to restore a healthy balance among the needs for secrecy, privacy, and publicity. (1) A vibrant, knowledge-based democracy requires timely public access to information about government policies and actions, most especially in the national security domain. Excessive secrecy diminishes public trust in government and squelches or impoverishes its participation. (3) Neither congressional, judicial, nor media oversight has succeeded in effectively curbing the power of the lords of secrecy, which grows with each successive crisis. Instead, the shibboleth of “national security” tends to elicit knee-jerk deference: those who might interfere mostly choose not to know, or, failing that, not to tell. (4)The best surviving safeguard for democratic debate is leaks, yet these are not a reliable protection, for several reasons. The accuracy of leaks can be difficult to verify. Lords of secrecy frequently leak for selfish, manipulative reasons, usually with impunity. Ordinary bureaucrats who leak, regardless of their motives, face loss of career and even criminal prosecution. Horton pays relatively little attention to the personal role of the president. Moreover, in his dim assessment of Congress, he seems to have in mind only positive legislation and other formal exercises of power. Ignoring political partisanship and the eroding norm of bipartisanship in foreign policy, he has little to say about whether congressional debate and criticism, hobbled by secrecy as it is, can significantly impact national security policy. POWER WARS, in contrast, is an extended case study with a legal focus, offering insights and raising questions that Horton does not focus on. Charlie Savage is a New York Times journalist with a Master’s Degree from Yale Law School. He offers a close-up account of what he and others have learned, through interviews, Freedom of Information Act (FOIA) requests, and leaks, about the evolution of national security policy and practice since 9/11. Savage previously published a book, TAKEOVER, on the Bush-Cheney years, and focuses here on the Obama years. His primary topic areas are detention and treatment of suspected terrorist captives, surveillance programs, targeted killings, secrecy/transparency policies, and responses to leaking. Savage repeatedly remarks on the continuities between Obama and Bush-Cheney policies, and on how Obama’s evolving policies contrasted with the administration’s expressed concerns for norms of constitutional separation of powers and civil liberties. Much of his narrative is entirely consistent with Horton’s argument. Given space limitations, we will focus on the respects in which Savage’s tale challenges or supplements Horton’s findings. As a Senator and presidential candidate, Barack Obama was severely critical of George W. Bush’s national security policies. People expecting a sharp change of course from his new administration witnessed early steps including a strongly pro-transparency Executive Order on classification, a ban on torture, and a promise to close the Guantanamo prison. Yet there were tensions among his advisers, and Obama did not take all the steps liberals had hoped for. A conservative counter-trend was sparked by the failed attempt to blow up an airliner over Detroit on Christmas day, 2009. The suspect’s arrest presented first responders and their Washington supervisors with many choices. The thorniest legal question was whether to give the suspect a Miranda warning. That was done, but only after some delay. Republicans castigated the administration for giving the warning; many thought military custody procedures should have been used from the outset. As a result of the political fallout, dramatic departures from Bush-era policies dwindled, and policies continuing or expanding those programs increased. Consequences included dropping the plan to try the 9/11 captives in civilian court, bipartisan passage of a new law barring the bringing of captives from Guantanamo into the country, dropping the idea of disclosing the NSA’s broad interpretation of its authority to spy on [*11] Americans, and the decision to assassinate a US citizen in Yemen whom the bomber had implicated in his plot. Savage focuses heavily on a subset of Horton’s lords of secrecy: executive branch lawyers charged with handling the legal aspects of national security issues. Their confidential advice plays a crucial role, for policymakers find it difficult to not take a potentially useful action once it is declared lawful, but nearly impossible to proceed if the action is deemed unlawful. Given the novelty of the legal issues, however, the answers are seldom obvious and often vigorously debated. Lawyers “can be caught between wanting to maximize flexibility for their president and wanting to make their advice conform to a principled worldview ….” (p. 38). The Bush administration had relied on the broadest possible assertions of unilateral presidential power, and been criticized for this on two separate grounds: civil liberties principles and rule of law/separation of powers principles. Obama and those who became his lawyers had tended to stress the latter more than the former. Thus, most of the denounced practices would become lawful if and when authorized by Congress or the courts. By the start of his term, in fact, most of these rule-of-law problems had already been fixed. Further, Obama’s actions in office did not always accord with his erstwhile views on such matters as use of executive privilege, signing statements, and power to bomb a country without congressional authorization. Loose campaign rhetoric had inspired excessive expectations. Still, Obama’s team had a far more lawyerly approach to government than the Bush-Cheney administration. Lawyers from multiple agencies were typically consulted, and were far less likely than their predecessors to embrace sweeping views of executive power to do anything deemed necessary. Each policy area—capture/detention/trials, surveillance, targeted killings, and secrecy/disclosure—had a unique, legally intricate, and fascinating story. Overall, however, a similar pattern emerged. In each area, Savage notes the contrast between Obama’s early statements (and the expectations raised thereby) and the ultimate course of events. Obama inherited from previous administrations an array of established programs, incumbent and former officials, secret legal memos, and ongoing legal proceedings. Liquidating or reforming these proved unexpectedly challenging; decisions were typically presented one small piece at a time, often in crisis mode, and complicated by internal debate as well as by the prospect of outside scrutiny. Bureaucracy can be downright unwieldy: Savage’s narrative is preceded by a cast of 78 characters—elected, appointed, and career officials, most of them quite obscure. An official told Savage, however, that internal debates had a pattern: lawyers or not, the permanent bureaucracy gets nothing from transparency or submitting to outside pressures, while political appointees understand that you need public support for things. Almost always there were lawyers on both sides, as the president had hoped, but, as White House counterterrorism adviser John Brennan put it in 2011, “I have never found a case that our legal authorities, or legal interpretations that came out from that lawyers group, prevented us from doing something that we thought was in the best interest of the United States ….” (p. 278). Savage finds only a few modest counterexamples to Brennan’s statement. Repeatedly, the option of ending controversial programs was discarded in favor of reforming them, and the reforms usually accomplished far less change than they appeared to require. For example, when the President insisted on deleting from a detention policy memo the option of [*12] indefinite detention without trial, aides disagreed as to whether he meant to forbid this option, or simply to refrain from putting it in writing. On other occasions, fear of outside criticism led political appointees to narrowly interpret efforts at reform. Already by 2009, “[I]t was striking how far Obama had already shifted from the expectations of change created by his campaign ….” (pp. 128-29). Critics of all stripes would feel free to claim that Obama’s reforms were “largely cosmetic” (p. 151), changing tone far more than outcomes. After 9/11, many programs were repeatedly expanded step-by-step, sometimes in violation of law and even of existing executive orders, backed either by expansive claims of presidential authority or even simply by terse orders from subordinates. Few of these moves were effectively stopped by the president, Congress, or a court. All were initially kept secret, and most ultimately sustained when they became public knowledge. Savage’s treatment of secrecy, central to Horton’s study, deserves additional detail. Obama, who had vowed greater transparency and promised to protect whistleblowers, has instead indicted nine leakers--three times as many as all previous presidents combined. Savage asserts that Obama’s crackdown has deeply chilled the existing, routine process of “[o]rdinary national security investigative journalism” (p. 359). Savage found no record of a formal decision to crack down on leakers. Two criminal investigations, inherited by the Justice Department from a special Bush-Cheney Leak Task Force, were entrusted to a zealous holdover official, and, as new cases came up one-by-one, amidst strident Republican denunciations of lax security, other DOJ officials somehow found themselves equating leaking with treason, labeling a reporter a criminal co-conspirator, and denying that reporters have a First Amendment privilege to protect confidential sources. Some said they thought they were acting as Attorney General Holder desired. Also, new technology that tracks data trails has advanced the ability to detect leakers. Subpoenas to reporters were resisted, and, though no First Amendment confidentiality privilege is recognized, no reporter was actually jailed for contempt. Ironically, conservatives who had charged that leaks proved the administration weak on national security also denounced it for subpoenas that targeted journalists. Obama later ordered tighter procedures for investigating the media. Most charges involved specific leaks, but the wholesale leaks by Bradley (now Chelsea) Manning and Edward Snowden attracted most attention. Some sentences were lenient, but Manning received a thirty-five year sentence, though acquitted of the military charge of “aiding the enemy,” a capital offense equivalent to treason. Snowden’s revelations about NSA spying “represented, by some measures, the most extraordinary breach of national security secrets in American history” (p. 401), setting off a national debate about the programs and a bipartisan embrace of reforms. Charged under the Espionage Act, he remains a fugitive in Russia. One case indicted a high-level official, Gen. David Petraeus, for disclosing classified information to his mistress, which led to a guilty plea and sentence of a small fine and probation. Other guilty pleas produced substantial prison terms. Savage reports that a number of investigations, most involving senior officials, ended with charges being dropped. While no one was prosecuted for the CIA’s torture program, a leaker who helped disclose it pleaded guilty and received a 30-month sentence. Savage vehemently opposes the criminalization of unauthorized disclosures. “I think this shift in how government deters leaks and deals with [*13] leakers endangers a free society and undermines self-government” (p. 389). He also rejects a standard that limits legitimate whistleblowing to disclosures that reveal waste, fraud, abuse of power, or illegality. That some leaks may not meet this standard, he argues, does not justify a war on leaking that equates it with spying or aiding the enemy. A 2013 White House statement recognized that “There are circumstances in which leaks are better addressed through administrative means, such as withdrawal of security clearances or imposition of other sanctions” than prosecution (p. 409). Still, the executive branch retains full discretion over how to proceed. Savage’s treatment of secrecy moves on to the use of the State Secrets privilege to defeat litigation against the government. This doctrine, concocted by the Supreme Court in a 1953 case, requires courts to simply take the government’s word and dismiss a case if the government asserts that allowing the case to proceed would endanger national security. As Louis Fisher has shown, the government had lied to the courts in that very case about what was at stake. The Bush-Cheney administration escalated use of this privilege to new heights. Obama’s team decided to sustain such claims in pending cases it inherited, and later began to invoke the doctrine on its own in new cases. The first steps were taken without Obama’s knowledge. In a familiar pattern, a new, stricter policy was announced on using the privilege, but changes in actual behavior were hard to detect. A related topic is use of the Executive Privilege doctrine to reject congressional demands for information. This doctrine dates back to another innovative Supreme Court decision, from 1974. While the Court invoked “precedents” dating back to 1796, its historical research was deeply unsound, as this reviewer has shown. Here, Obama inherited a lawsuit filed by congressional Democrats whose investigation of allegedly improper actions by the Bush-Cheney administration had been stymied by an executive privilege claim. Obama, expected to quickly surrender the disputed documents, instead decided “not to do anything that would undermine or weaken the institution of the presidency” (p. 425). Accordingly, a settlement was reached and the lawsuit dropped, avoiding a possible ruling in favor of Congress. In an early 2013 speech, Obama declared that his was the most transparent administration in history. He had indeed made some unprecedented disclosures, including a number of legal memos, and claimed to have reduced the annual volume of documents classified from about 200,000 under Bush to some 47,000 in 2014. (These figures are a lower order of magnitude than those offered by Horton, because the speech quoted by Savage referred to “original” classifications, while Horton’s figures include “derivative” classifications.) Yet efforts to deter media contact or publications by current and former employees continued. Insofar as voluntary official disclosures had prompted courts to rule that certain documents could no longer be classified, “the lesson for the future was clear: be even more secretive, and use only unofficial, anonymous leaks when communicating anything to the public” (p. 471). Savage’s ability to assemble his story shows that the veil of secrecy is not utterly impermeable, though he often notes information and documents that he was unable to obtain, or to obtain only after years’ delay. Significantly, only fragments of his narrative were available when Obama ran for reelection. Savage provides far more information than Horton about the limited role of the President. Formally, the president is the overlord of secrecy, chooses the top bureaucratic leaders, and issues guidelines for handling information. Savage’s account indicates, however, that the lords of secrecy have more influence on a president’s policies than he does on their routine activities. The academic concept of a unitary executive has no basis in fact. Separate bureaucratic actors often openly debate and sometimes quietly maneuver against each other, with the president seldom being called upon to engage with an issue until his signature on a policy document is called for. At that point, matters are typically too far along for a fresh start. Further, while Democratic and Republican presidents assemble separate national security teams, career officials and the path to recognized expertise provide significant continuity across administrations. Savage generally accepts the sincerity of his sources and respects the severe pressures they were under. Rather than making ad hominem judgments, he raises important questions about the health of the system, questions that closely parallel those raised by Horton. Horton surely would agree with Savage’s assessment that “executive power tends to act like a ratchet: a president does something unprecedented that seems like the new outer boundary, but then a successor treats that as a baseline and goes even further” (p. 663). Savage suggests that Obama’s commitment to legal process actually contributed to this ratcheting effect. “The bureaucratic system … set up to require consensus … served to heighten the already considerable influence of the national security establishment, which prized counterterrorism powers, stability, and secrecy over openness with the public and protections for individual rights” (p. 694). Savage focuses on democratic theory only in the context of press freedom, where his position strongly supports Horton’s proposition (4). He shares Horton’s appreciation of the vital role of leaking for sustaining public knowledge and involvement, and also Horton’s skepticism that the current system can adequately sustain a knowledge-based democracy. Savage’s accounts of secrecy and bureaucratic behavior confirm Horton’s proposition (2). With regard to Horton’s proposition (3), Savage provides evidence for a large impact of congressional criticism, but does not show that this impact effectively checks the lords of secrecy. As Savage notes, there is no anti-secrecy caucus in Congress. Neither author examines the larger effect on democracy of our current political party and election systems. Both authors deplore the courts’ excessive deference to secrecy and claims of executive power, but neither advocates for a more vigorous interpretation of what the First Amendment must require if the system is to thrive. Taken together, these books provide a sobering view of the national security state’s impact on civil liberties and the rule of law. Fisher, Louis. 2006. IN THE NAME OF NATIONAL SECURITY: UNCHECKED PRESIDENTIAL POWER AND THE REYNOLDS CASE. Lawrence: University Press of Kansas. Hoffman, Daniel N. 2015. “Constitutional Faith, or Constitutional Stealth: The Puzzling Resurgence of American Monarchism.” CONSTITUTIONAL COMMENTARY 30(3): 611-637. Hoffman, Daniel N. 1981. GOVERNMENTAL SECRECY AND THE FOUNDINNG FATHERS: A STUDY IN CONSTITUTIONAL CONTROLS. Westport: Greenwood Press. Moynihan, Patrick F. 1988. SECRECY: THE AMERICAN EXPERIENCE. New Haven: Yale University Press. Rourke, Francis E. 1957. “Secrecy in American Bureaucracy.” POLITICAL SCIENCE QUARTERLY 72(4): 540-564. Shils, Edward A. 1956. THE TORMENT OF SECRECY: THE BACKGROUND AND CONSEQUENCES OF AMERUCAN SECURITY POLICIES. Carbondale: Southern Illinois University Press. Weber, Max. 1978. WIRTSCHAFT UND GESELLSCHAFT. Berkeley: University of California Press.